Bishop T. D. Jakes is an American pastor, author and filmmaker. He is the bishop of The Potter’s House, a Nondenominational American megachurch. 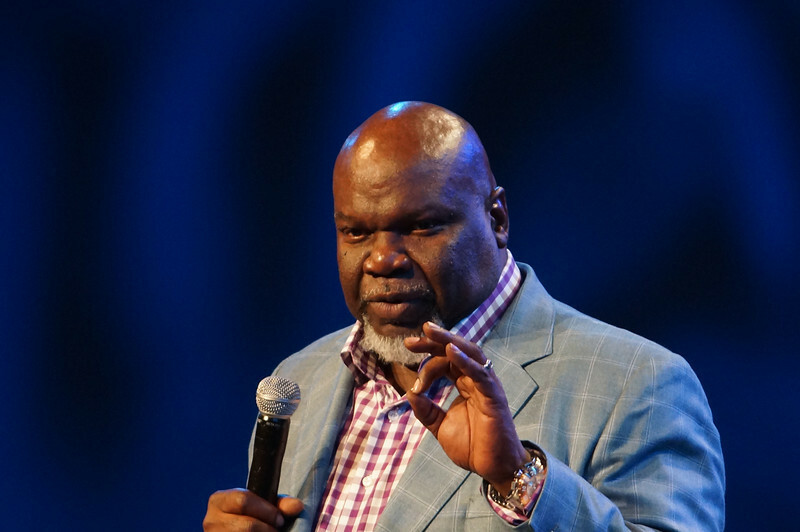 Early Life and Ministry: Born (Thomas Dexter Jakes) on June 9, 1957, to the family of Ernest and Odith, and raised in Charleston, West Virginia, Jakes grew up in a community where it traditionally took a village to raise a child. Every adult in the community contributed to the children’s upbringing. At an early age, he was described as opinionated, stubborn, and driven—traits that some still ascribed to the adult Jakes. He was also nicknamed “Bible Boy” due to his early habit of preaching to an imaginary congregation and always carrying his Bible to school. Jakes realized his call to ministry at age 17. Jakes’ parents, Ernest and Odith, evidenced a strong work ethic and entrepreneurial spirit that would later characterize their preacher son. Odith, an economics teacher, taught all three of her children to cook, sew, and clean for themselves. Ernest, a self-made businessman, was entrepreneurial long before entrepreneurs were common among blacks. Ernest developed a janitorial business from one mop and bucket to include 42 employees who cleaned everything in the Charleston area—from the West Virginia Capitol building to grocery stores. This entrepreneurial drive left a mark on young Jakes, who delivered newspapers, Avon, and even products from his mother’s garden. Although working full-time at a chemical plant job with Union Carbide, Jakes was also involved as the part-time music director at the Baptist Church where he grew up and as a part-time street evangelist. When the Charleston-area chemical plant closed in 1982, and his father died of kidney disease, Jakes devoted all his time to his ministry as an evangelist and church-planter in the Charleston area. Jakes grew up in Vandalia, West Virginia, attending local Baptist churches. He spent his teenage years caring for his invalid father and working in local industries. Feeling a call to the ministry, he enrolled in West Virginia State University and began preaching part-time in local churches, but he soon dropped out of the university. He took a job at the local Union Carbide and continued preaching part-time. During this time he met his future wife, Serita Jamison. The couple married in 1981. In 1982, Jakes became the pastor of the Greater Emanuel Temple of Faith, a small, Montgomery, West Virginia independent Pentecostal church with about ten members. In a few short years the church grew enormously. Just as importantly, it transcended racial lines bringing together an integrated congregation and overcoming the diverse elements that traditionally divided the community. This helped increase his renown as a speaker and pastor. Jakes moved the church twice – from Montgomery to Smithers and then to South Charleston, where the congregation grew from about 100 members to over 300. During this time, he began a radio ministry The Master’s Plan that ran from 1982-1985. In 1993, Jakes self-published his first book, drawing on his experiences working with the women of his congregation. Woman, Thou Art Loosed would become Jakes’ signature work and a national religious bestseller. He also began a new television ministry, Get Ready, which aired on Black Entertainment Television and the Trinity Broadcasting Network. Also in 1993, Jakes moved his church yet again, to Cross Lanes, West Virginia. His ministry continued to expand, prompting the founding of the T. D. Jakes Ministries organization to oversee his work beyond the church itself. He continued to write and to publish, spreading his message of spiritual healing to new audiences. In 1994 he held the first of what would become a series of conferences for ministers and their spouses, “When Shepherds Bleed. In May 1996, Jakes moved his family and his ministry again, as well as fifty other families involved in his work, to Dallas, Texas. There he purchased Eagle’s Nest Church, a large Dallas church. Renaming the church The Potter’s House, Jakes continued his work. The Potter’s House, which was a 5,000 seat auditorium and a 34-acre campus, had grown to a congregation of 30,000. On the PBS program African American Lives, Jakes had his DNA analyzed; his Y chromosome showed that he is descendant of the Igbo people of Nigeria. According to his family history, it was suggested that he is also descended from them through his grandmother. As a devoted husband to his wife, First Lady Serita Jakes, Bishop Jakes eagerly supports his beautiful wife of more than 35 years. Serita Jakes, a best friend, a mother, a grandmother, and a loving wife, is Bishop’s chief advocate as well. Serita and T.D. have managed every business opportunity, as well as personal endeavors with their unwavering faith in God. The power couple has successfully raised five beautiful grown children, including Sarah Jakes, Cora Jakes-Coleman, Thomas Jakes, Jr., Jermaine Jakes, and Jamar Jakes.